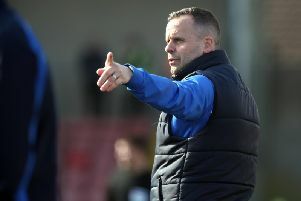 Linfield moved to the top of the Danske Bank Premiership on Saturday after a 3-0 win over Ballinamallard United. With Portadown’s surprise 2-1 defeat to Warrenpoint Town, the leaders going into the weekend’s matches now find themselves third. Defending champions, Cliftonville, who were 4-0 winners against Institute moved second on goal different from the Ports. Coleraine leapfrogged Glenavon into sixth place after a 3-2 win and Glentoran won by the same scoreline at Stangmore Park against Dungannon. Crusaders were 2-0 winners over Ballymena United.